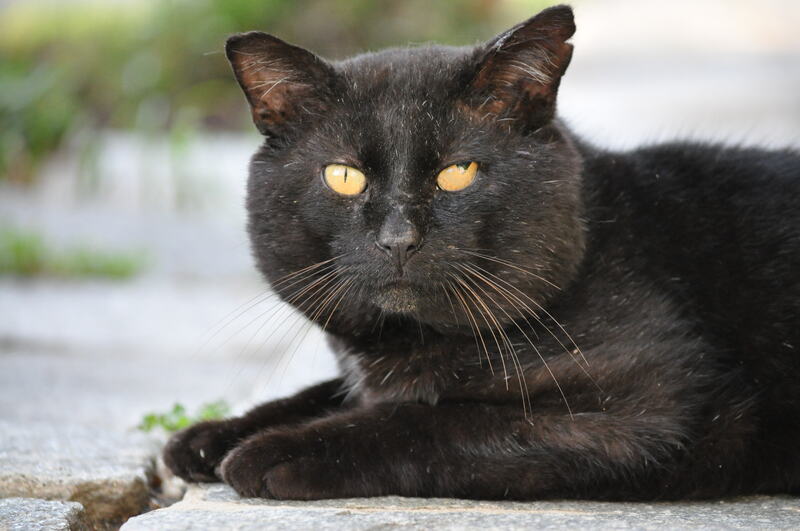 A few months ago, I put up a couple of posts about Blackie, a stray cat. So far, we’ve failed to find a home for him. Yesterday evening, he came around with the skin of a significant part of the right side of his face torn off. We can’t imagine what happened. It looks just awful. We tried to coax him into a carrying case to take him to a vet without success. Tonight we’re going to try to use a live animal box trap, sometimes called a Havahart trap. He’s walking around, eating, marking his territory, so as bad as he looks, he’s not near death. However, the wound is very close to his good eye and if he loses that his future is not bright. Keep your fingers cross that we can catch him and that his injuries can be treated. He’s at least eight years old and he’s a polydactyl. (Update) I’m sorry to say that Blackie had to be put to sleep. I wasn’t exaggerating when I wrote that a large portion of the right side of his face was gone. It was quite a shocking sight. My sister took him to the Animal Hospital where the vet said that he was suffering from necrosis. He needed multiple surgeries and she thought his prospects of survival were very low. She said that there wasn’t enough skin left to repair the wound. We’re all just very sad right now. We so much wanted to help him. Thanks. We’re still trying to get him in the trap.